I have been working on September's ADSD group Collab and I photographed a couple of my many baskets to use as elements in the kit (I'm gonna fill them with stuff). I used to collect these baskets, you know the ones I mean - those expensive baskets that begin with an "L" lol. These days they just collect dust and I should put them up on Ebay but I figure I may as well get some use out of them! Funny, they are more use to me digitally than in real life! And I also photographed this little pine birdhouse that I bought at the dollar store and cut out the hole so you can put a little birdy behind it! I am excited about the Collab, the previews are awesome! You will have so much fun downloading everything on September 1st! Anyway, don't look at these baskets too close or you will see all the dust on them! Housework has taken a back seat lately to everything else! Also, you know I am never happy with my extractions so you may need to clean them up a bit before you use them. I hope you do get some use of them! 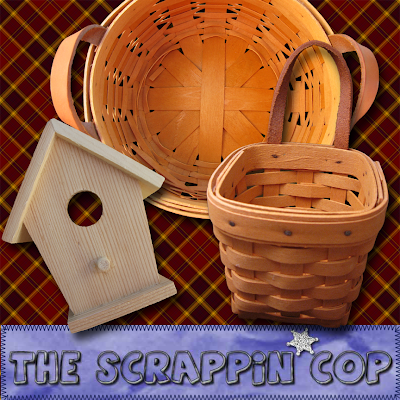 Thanks for the baskets and birdhouse. You come up with some neat stuff for us. Have a great Monday! I didn't even know anything about those "L" baskets until I moved to the part of the country where they are made. And when I saw the $$, well, these are as close as I'll get to owning one. I never was that into baskets. LOL Thank you. Thanks ! it's gorgeous !! Your designs are original !! Love the basket! Thank you! Great job - these are awesome!! !